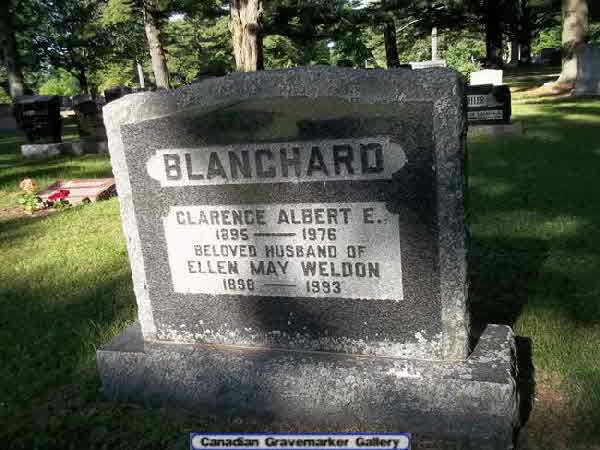 Marriage* Ellen May Weldon married Clarence Albert Ernest Blanchard, son of Richard Blanchard and Mary Ann Gibson, on 1 July 1926 in Thorah Twp., Beaverton, Ontario County, Ontario, Canada. 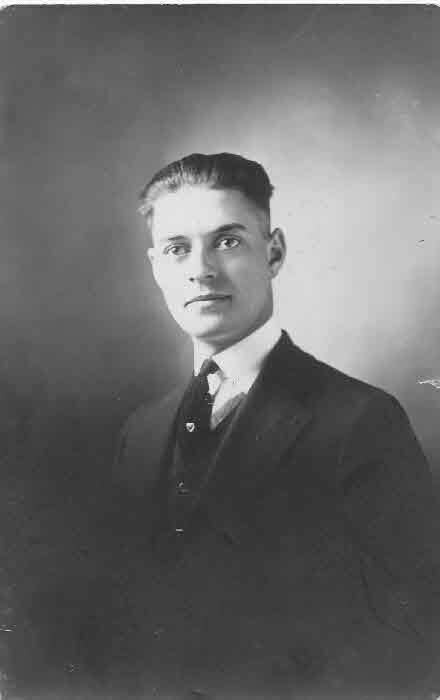 Birth* George Arthur Weldon was born on 8 April 1873 in Scott Twp., Ontario County, Ontario, Canada. 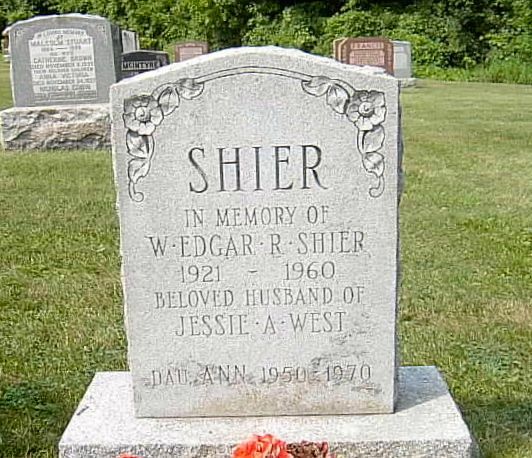 Marriage* George Arthur Weldon married Ida Thressa Shier, daughter of Wellington Shier and Elizabeth Ann Dixon, on 7 March 1900 in Brock Twp., Ontario County, Ontario, Canada. Death* He died on 23 April 1937 in Uxbridge, Ontario County, Ontario, Canada, at age 64. Birth* Ida May Weldon was born on 17 April 1877 in Scott Twp., Ontario County, Ontario, Canada. 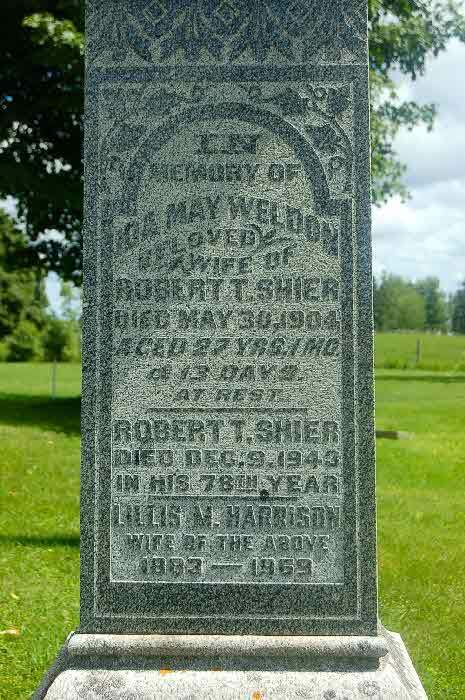 Marriage* Ida May Weldon married Robert Timothy Shier, son of James Shier and Mary Ann Mooney, on 1 March 1899 in Scott Twp., Ontario County, Ontario, Canada. 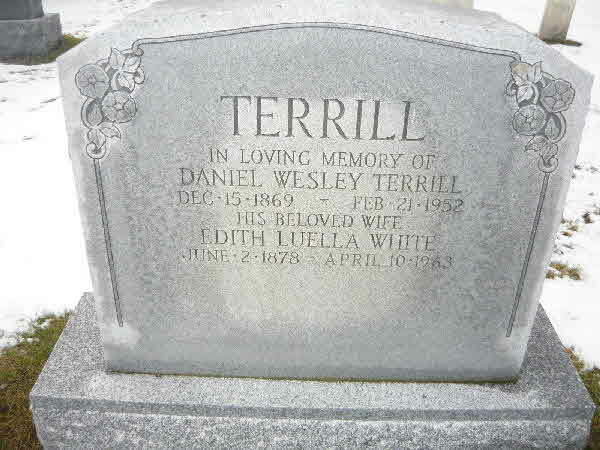 Burial* She was buried in Foster Memorial Cemetery, Scott Twp, Ontario County, Ontario, Canada. Fact 1* William Henry Weldon and Annie Maud Shier. Death* He died on 1 December 1937 in Uxbridge, Ontario County, Ontario, Canada, at age 69. 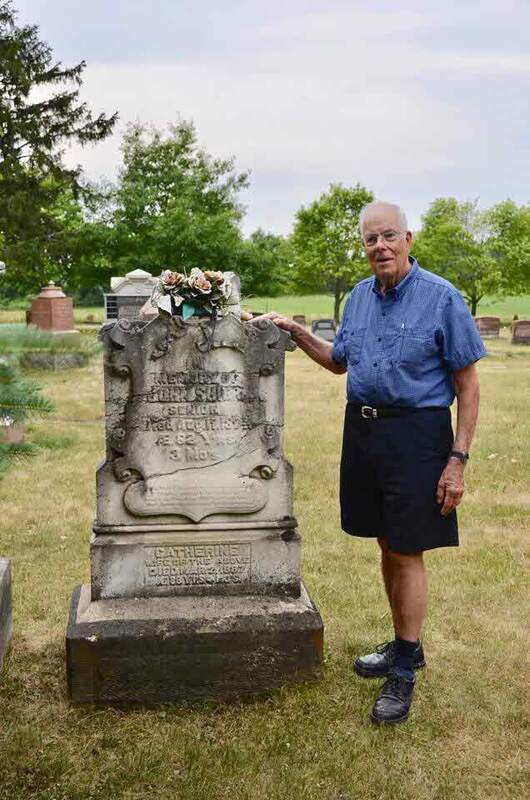 Fact 1* Bill Weldon standing beside the grave of his GG-Grandparents, John Shier II and Catherine Piper, St. John Cemetery, Brock Twp. 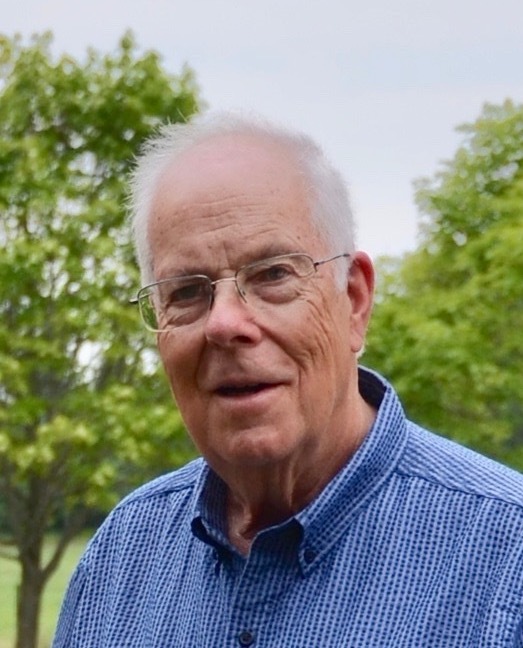 Death* William Ross (Bill) Weldon died on 3 April 2018 in Toronto, York County, Ontario, Canada, at age 78; Bill passed away on April 3, 2018 at the age of 78, leaving behind his wife Connie and children, Lisa (Chris), Christina (Kristin), and Michael (Alma). Bill was Papa to Maya, Madeleine, Keira, Olivia, Jackson, Liam and brother to Rosemary. 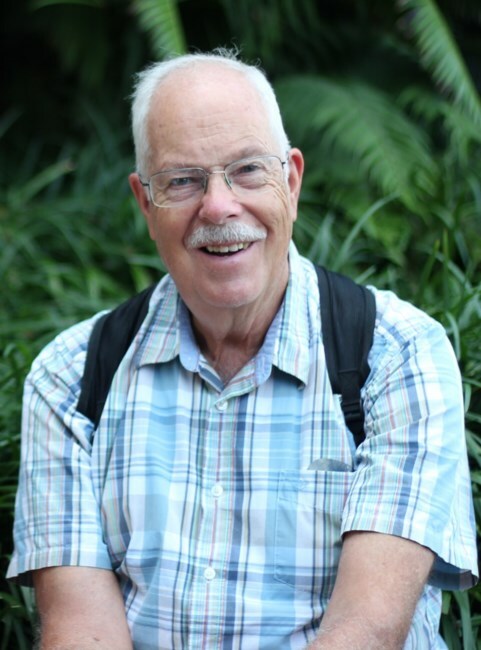 After retiring from the Toronto District School Board, Bill continued as a piano teacher, accompanist, and church organist. We will remember and miss this gentle man who loved his family, music, travel, and daily walks searching for the elusive bird. 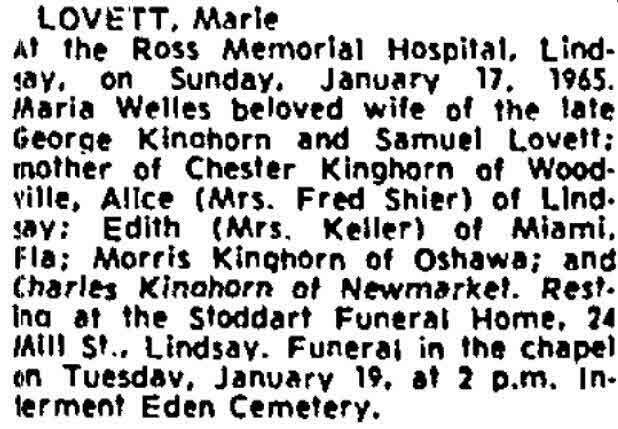 Death* Maria Wells died on 17 January 1965 in Ross Memorial Hospital, Lindsay, Victoria County, Ontario, Canada. 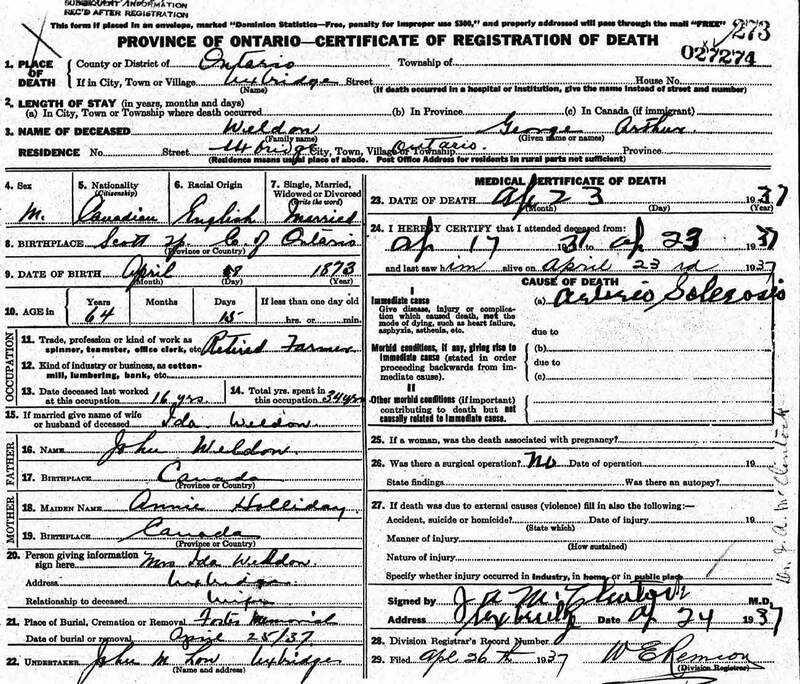 Marriage* Bertha Welsh married Percival Alfonco Chirnside, son of Thomas William Chirnside and Phoebe Alice Shier, on 24 February 1903 in Beaverton, Ontario County, Ontario, Canada. 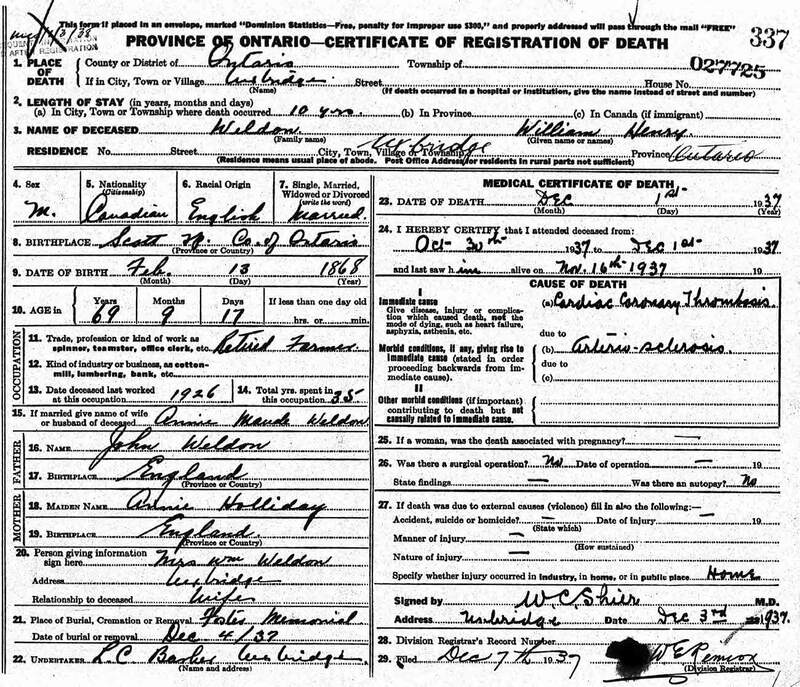 Death* He died on 4 April 1950 in 41 Warsley Street, Barrie, Simcoe County, Ontario, Canada. 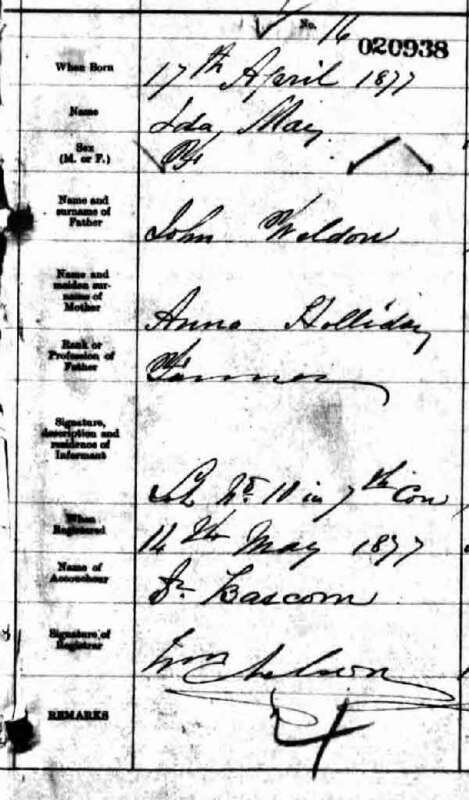 (Witness) Census Annie West appeared on the census of 1911 in the household of John Shier in Harting, Sussex, England. 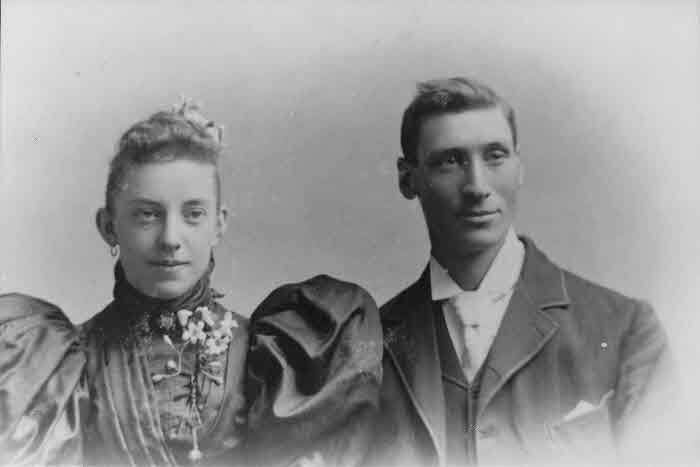 Marriage* She married Duncan Campbell, son of Nicol Campbell and Flora Carmichael, on 10 July 1907 in Thorah Twp., Ontario County, Ontario, Canada. 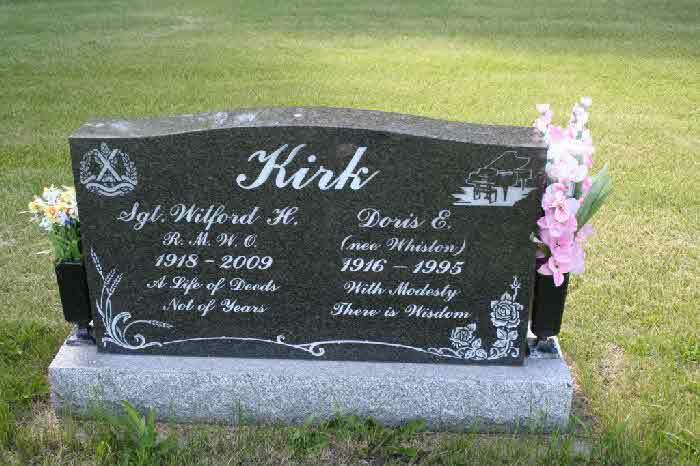 Burial* She was buried in Gamebridge Cemetery, Mara Twp., Ontario County, Ontario, Canada. 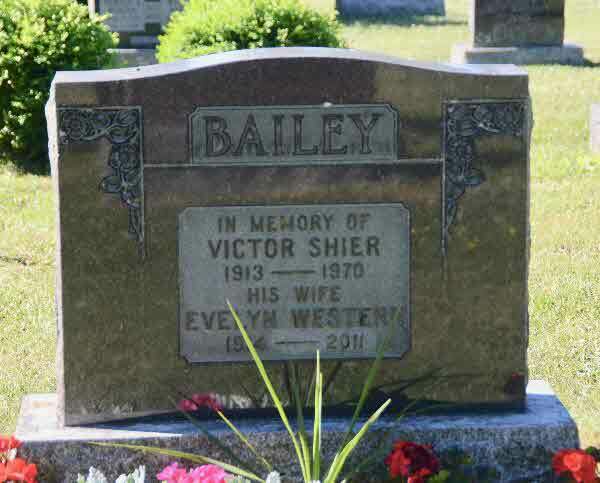 Marriage* Evelyn Annetta Western married Victor Shier Bailey, son of William Henry Bailey and Emma Adeline Shier, on 27 October 1934 in Mariposa Twp., Victoria County, Ontario, Canada. July 8 in Dawson Creek at age 79. 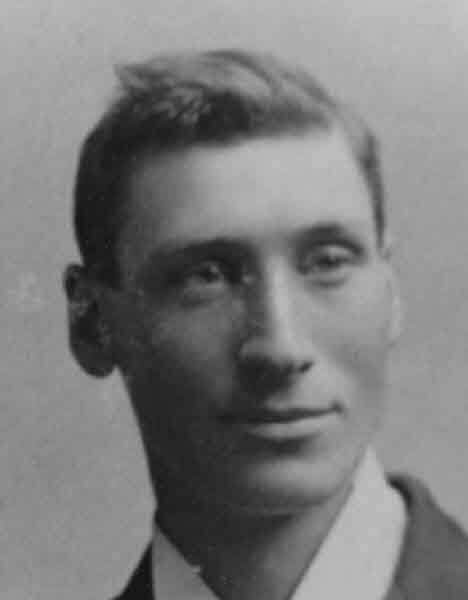 Youngest son of James and Laura Whenham, Llyn was born in Carmangay, Alberta. He joined the Royal Canadian Air Force as a young man, and spent many years in the oil patch before joining Immigration Canada. At the time of his retirement, Llyn managed the immigration office in Dawson Creek. Llyn will be long remembered for his 47 years of service to the Royal Canadian Legion, his love of sports, and the excellence of the wine and beer he produced in his basement. He and his wife, Gail, shared a delight in gardening and culinary adventure and a profound love of animals. Llyn is survived by his beloved Gail, his children: Llynne, Judith, and Steven, and by one of his three brothers, Donald Whenham. Llyn has four grandchildren: Tyler, Spencer, Elizabeth, and Jesse as well as five great grandchildren. His many nieces and nephews will remember his kindness and his great sense of humour. His sister-in-law, Doris Clark, and her family will remember him with love always. In lieu of flowers, donations to the Dawson Creek SPCA or to The South Peace Hospice/Palliative Care Society in his name would be much appreciated. There will be no funeral service as per Llyn’s request; a memorial will take place at a future date. 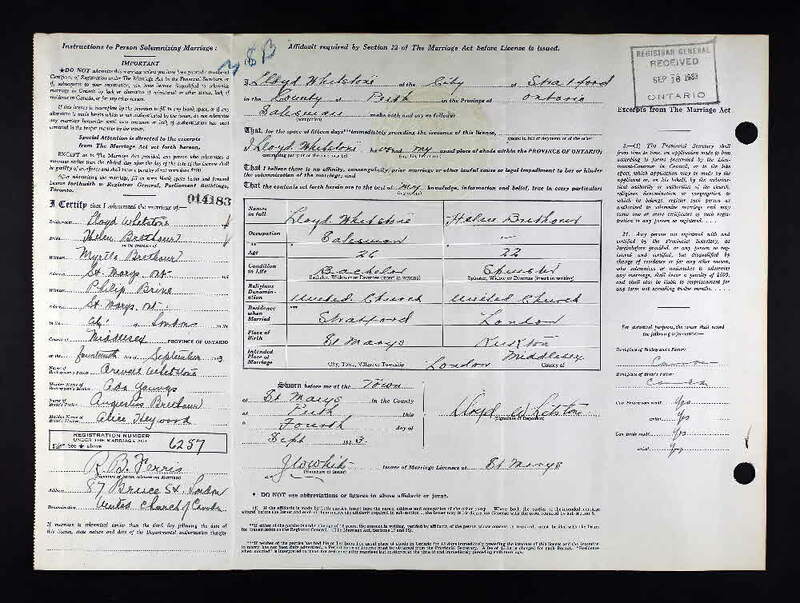 Fact 1* Born at Pilot Mound on 10 May 1896, son of James Whenham and Sarah Jane Clark, he was working as a teacher when, in 1917, he enlisted in the Canadian Expeditionary Force and served overseas until his discharge in early 1919. 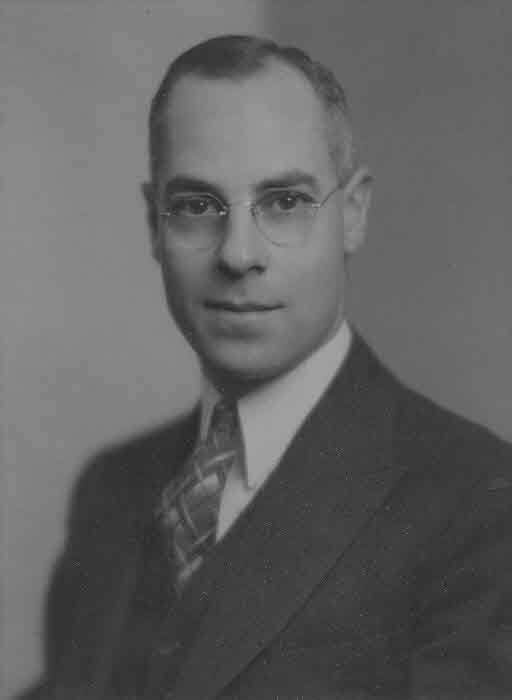 He returned to teaching and served as the Principal of Isabella School (1922-1925), Decker School (1925), Arden School (1925-1927), and Bowsman School (1927-1930). 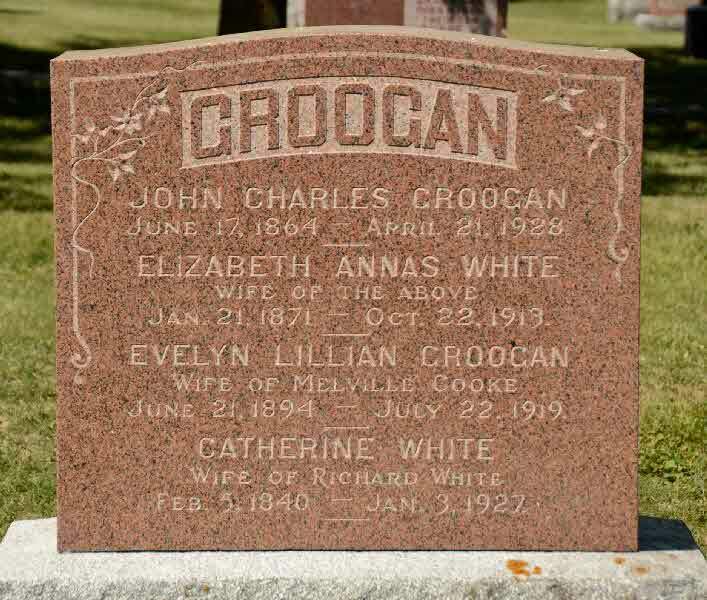 On 15 August 1921, he married Laura Churchill at Brandon. He is reported to have died in 1970 but, as yet, no further information has been found. Marriage* He married Helen Eddy Brethour, daughter of William AUGUSTUS Brethour and Alice Maud Mary Heywood, on 14 September 1933. Fact 1* The L.O. 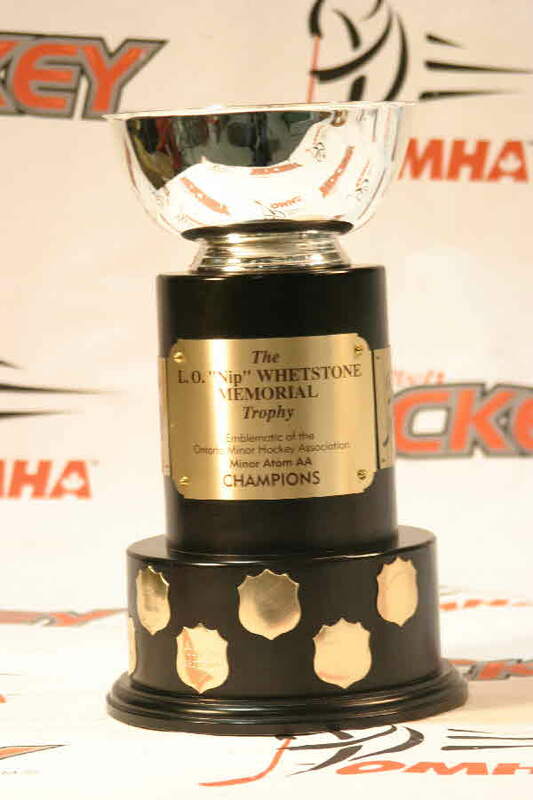 “Nip” Whetstone Memorial Trophy was first won by Whitby in the 1986-87 season. This trophy is named after the 1954 OMHA Honour Award winner from Goderich. It remains in circulation today. Burial* He was buried in Maitland Cemetery, Goderich, Huron County, Ontario, Canada. 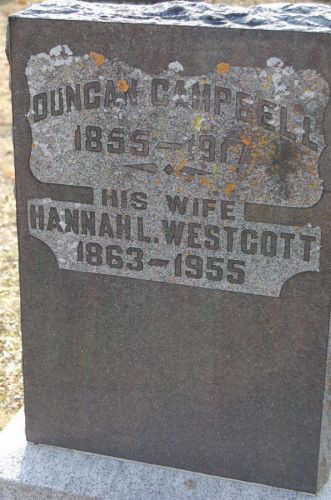 Burial* She was buried in Ingleside Cemetery, Marchwell, Melville Census Division, Saskatchewan, Canada. 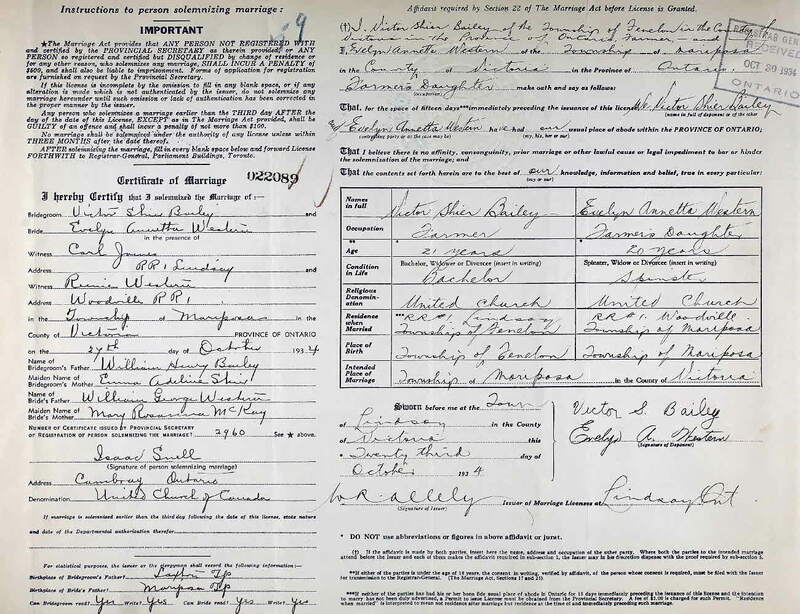 Marriage* Richard Whitaker married Jane Shire, daughter of Hugh Shire, on 2 October 1876 in Killeedy, County Limerick, Munster, Ireland. 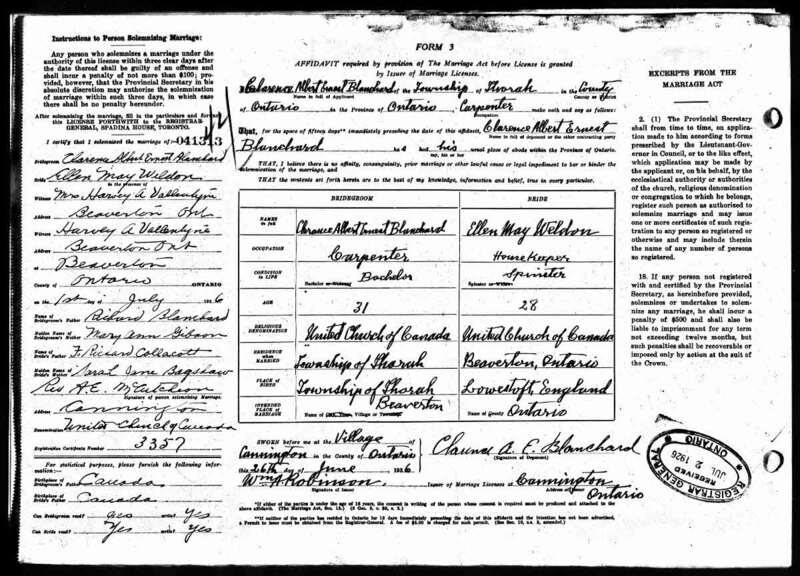 Marriage* Benjamin William White married Alice Pew, daughter of Robert Pew and Isabella Somerville, on 15 May 1883 in Lindsay, Victoria County, Ontario, Canada. 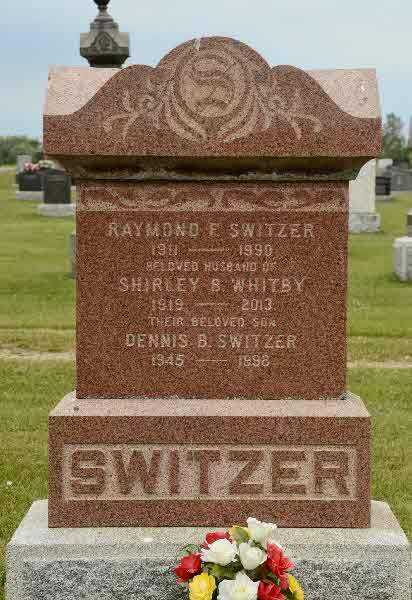 Death* He died on 19 October 1925 in St. Michaels Hospital, Toronto, York County, Ontario, Canada, at age 66; multiple fractures due to an auto accident. Marriage* Catherine White married Richard White on 16 March 1870 in Ontario County, Ontario, Canada. 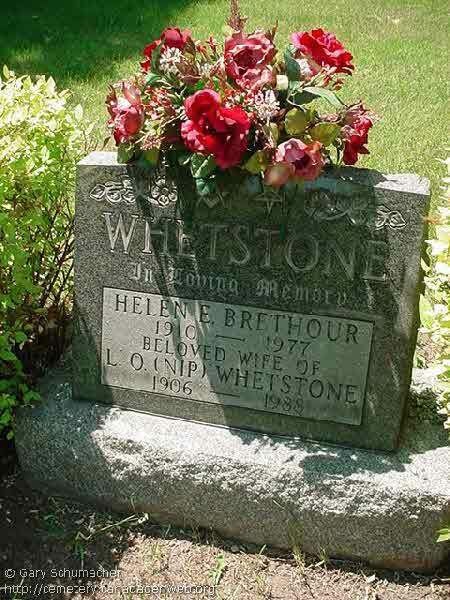 Death* Catherine White died on 3 January 1927 in Brock Twp., Cannington, Ontario County, Ontario, Canada, at age 85. Burial* She was buried on 5 January 1927 in Cedar Vale Cemetery, Brock Twp., Cannington, Ontario County, Ontario, Canada. 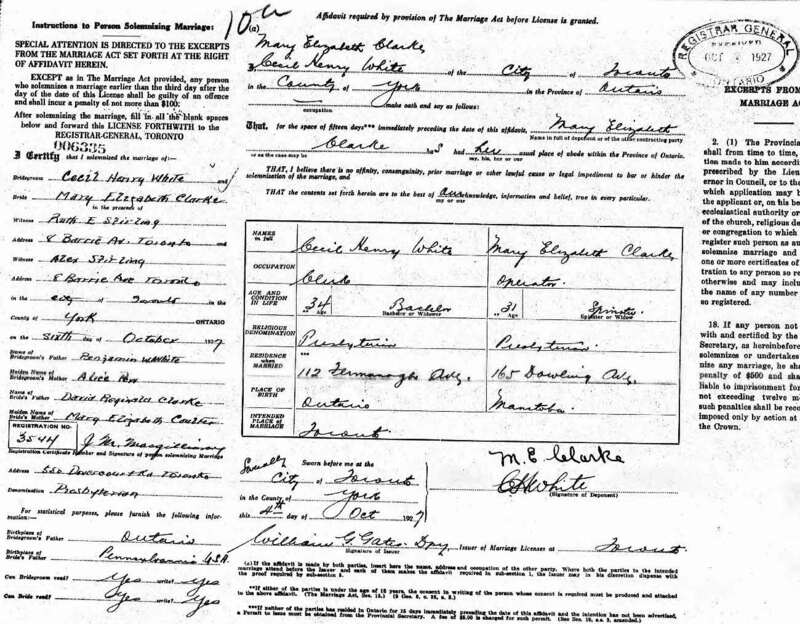 Marriage* Cecil Henry White married Mary Elizabeth Clarke, daughter of David Reginald Clarke and Mary Elizabeth Couzter, on 6 October 1927 in Toronto, York County, Ontario, Canada. Death* Charles CECIL White died on 28 December 2016 in Cobourg, Northumberland County, Ontario, Canada, at age 94; WHITE, Charles Cecil - Peacefully at Northumberland Hills Hospital, Cobourg on Wednesday, December 28, 2016 in his 95th year. Beloved husband of the late Flossie Bell White. Loving father of Gloria Shier (Paul), Edward (Donna), Arnold (Valerie), Kelvin, and Karen Page (Ken). Grandfather of Scott Shier (Kim), Lori - Ann Bacon (Brian), Deanna Slama (Matthew), Kelly White, Jeff White, Richard Page (Tasha) and the late Melissa Page. Great-grandfather of Alexander, Jacob, Camden, Liam, Alexis, Kurtis, and Bailey. Step-grandfather of Alex, Cameron, Ian, Mia Jennings, and Crissa Gusikoski. Charles was a talented musician and a proud veteran of the Second World War. He was always cheery, loved entertaining and socializing whenever he got a chance. He was cherished by his family but especially his grandchildren. Birth* Edith (Alma) Alva White was born on 6 November 1886 in Brock Twp., Cannington, Ontario County, Ontario, Canada. Burial* She was buried in Linden valley Friends Cemetery, Mariposa Twp., Victoria County, Ontario, Canada. Birth* Effie Blanche White was born on 3 July 1890 in Brock Twp., Ontario County, Ontario, Canada.